10 Matches were played, the result was 5-5, an honourable draw. Due to the bad weather conditions, no competitors took part. Competition for today was cancelled due to the foggy conditions. Competition was cancelled due to the foggy conditions. No entries for this competition. Diane Walker wins the knockout stage of the Chipchase Vase by beating Sheila Robinson in the final. 3 qualifiers for Hedworth Williamson final to be played later in the season. Yvonne Grunson holed her tee shot on the 10th. Qualifiers for the Fenwick Salver - Sheila Robinson, Serina Turnbull. Thankyou to all who supported our Pink Fund raising day, A cheque for £300 will be sent to Breakthrough Breast Cancer. Only 12 out for the competition today. The weather turned out alright in the afternoon considering what the morning was like. Some good scores. What a terrible day. It didn’t stop raining, the bunkers were out of play so it didn’t count for handicap, luckily for some of us!!!. 3 to qualify for the Hedworth Williamson trophy. At least we stayed dry today and it wasn’t too bad a day. Two to qualify for the Fenwick final. Our numbers are well down for this year, hopefully that is because of the weather. Another windy day, when will we get some good weather? The winner today goes through to the County Final at South Moor later in the year. The numbers are going down unfortunately, even though it was a lovely sunny day. Stroke competition in the morning followed by a fun 9 hole 3 club competition. A lovely sunny spring afternoon. 4 pairs to qualify for the match play rounds. A really cold blustery day for our replay. Only 7 pairs out which is a shame. The winners go on to Gosforth for the area final. Well it started out as a lovely day until the fog came in. 14 of us out to play golf, joined later by other past captains for a nice meal. What a civilised day, golf followed by a meal!!! Why is it always windy / wet on a Tuesday afternoon? It was blowing a gale this pm add that to the rough which is getting quite high now and it made for a tricky afternoon. Well, conditions were so much better today. Good game for Pauline to reduce her handicap. Pauline wins the trophy with Carol a couple of shots behind. Well the weather is beginning to improve at last. A good entry with a lovely sunny afternoon, 8 to qualify for the knockout stages. Other qualifiers Jenny Collier, Carol Hall, Pearl Dunlop, Joan Atkinson and Sally Grieves. A lovely but very windy day meant conditions were difficult. A good game for Maureen pulling her handicap by a good few shots, she obviously wasn’t playing the same course as the rest of us!!!! The same as last year only 3 pairs entered the actual Ping competition to go forward to the final . A good afternoon especially for the County Ladies Charity which this year is ‘Daft as a Brush’. A charity supporting cancer care for patients. A total of £225 was raised through donations and the raffle. What a lovely day weather wise and Irene made it very special. Thank you Irene for all your hard work. A lovely sunny but very windy day. One of our better days for the numbers out playing. A lovely sunny afternoon, what a shame there were only 4 players. A great score for Irene. A few people crossed off today which was a shame as the weather was lovely. A great score for Marjorie reducing her handicap by two. A fine but windy afternoon which meant most players seemed to find it hard going. Last chance to qualify for the Fenwick Final. A tie for today’s competition. Play off at another time. What a windy day the golf ball was going all over the place, everyone found it tough going. Thanks to Irene for providing the cakes for our afternoon tea and to Captain Ted for the prizes. A lovely afternoon but just a couple out to play. A big thank you to our President Peter Taylor for providing the vouchers for today’s competition. Unfortunately for us the greens had just been hollow tined and dressed, we also had to cope with the swirling wind. There were still a couple of good scores though, well done to both. Another very windy afternoon. All donations today along with the money from our Coffee Morning go to the charity. An amazing £355 was raised. Another sunny but windy day. Numbers are still well down which is a shame. Our annual competition with our Neighbours. Whitburn hosted the competition this year and also won the trophy, with only 6 players. 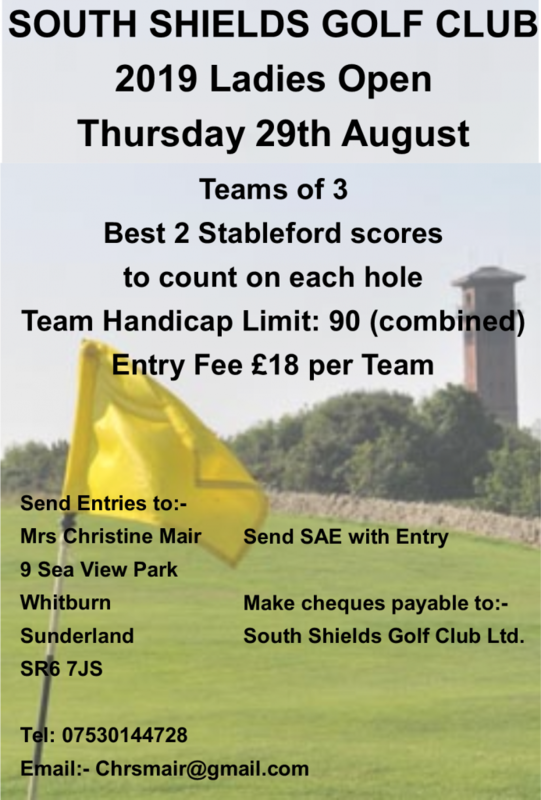 Well done to Joyce Baker 36 pts and Sally Grieves 33pts both playing at S/S and to Pauline Porteous 29pts at Whitburn. Whitburn 195, S/S 177 and Boldon 164. The winning pair go on to play in the National competition in 2019. A very blustery day once again. Another very windy day, the five out to play did manage the 18 holes though. The competition was reduced to 12 holes because of the wind. It is supposed to be fun at this time of year!!!! !